Rolfing is all about alignment. So what’s the big deal? Why should I worry about whether my hips stack over my feet or not? There are several reasons, and being a Rolfer, this is a topic I could talk about for hours on end. But let’s focus on one of the more basic issues right now: the physical effects of being out of alignment. Look at the image above. 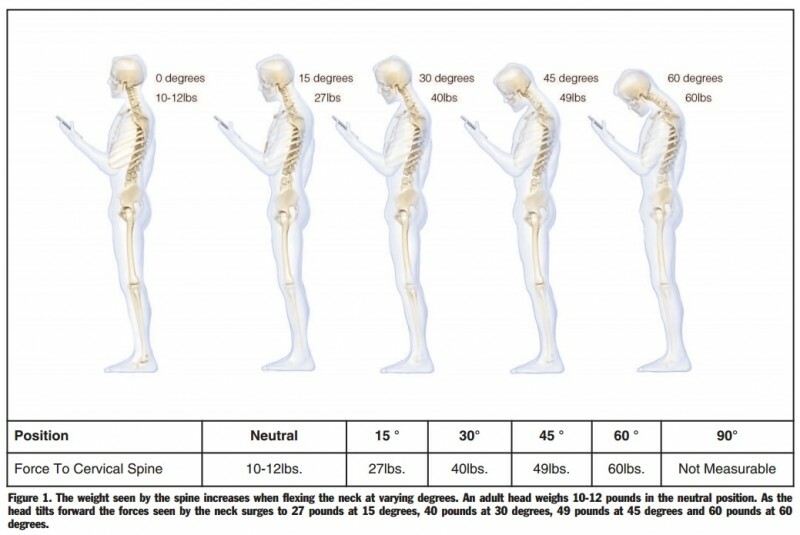 This is from a study done by a spine surgeon to calculate exactly how much force is put on your neck when your head is in positions other than neutral, specifically when you’re looking at a cell phone. Pretty scary, right? Your head, which normally weighs 10-12 pounds, can end up putting 60 pounds of force on your neck. The bad part about this is what we all do it. Worse, we’ve all seen people (or perhaps are those people) whose heads are stuck in that position even when they’re not looking at their cell phone. Why does our body get out of alignment? If you didn’t want to watch it, let me summarize: All day long, but especially at night when we sleep, our bodies are producing fascia (a type of connective tissue) that gives our bodies shape. Fascia essentially reenforces areas of our bodies, either due to injuries or habits. If you produce a small amount of “fuzz” at night but then get up and move normally through your full range of motion the next day, the fuzz will dissipate and you won’t have any long-term restrictions. However, if you don’t move through your full range of motion due to injury, habits, external circumstances, etc., the fascia remains. The next night your body will put down more tissue, and the process repeats. If you don’t move enough to dissipate the fascia for a long enough period of time, your body quite literally becomes “stuck” in a certain position until it can be released by something like Rolfing. The effect of improper alignment. Going back to the image at the beginning, our bodies are meant to stand up straight. They may not be perfect machines, but they have been formed to do a pretty good job of keeping us upright. When you stand with ideal posture, your body will feel weightless. That is to say, you won’t notice any strain in your back, your calves, your neck, etc. If your body has been “locked” into a certain position via fascia or “fuzz,” your muscles will have to strain significantly harder in order to keep you upright. Thus the importance on keeping ourselves neutral. This brings up another point: the difference between “natural” alignment and “forced” alignment. Pretty much anyone can have a posture that looks good if they force themselves to stand up rigidly. Think of the typical military posture: back straight, chin up, eyes forward. But how long can you hold this posture? The answer is probably not very long, at least without getting very tired. On the other side of things, natural alignment is the alignment your body falls into when you just stand neutrally. In Rolfing, we aim to get the body to its natural alignment being, well, aligned. If your body naturally falls into the ideal alignment, your muscles can relax, your bones can stack, and your energy can be put to much better use than just trying to keep you up straight. So, in the end, here’s my simple explanation of why alignment is so important: because it’s so much easier. Easier on your body, your muscles, your energy level, and your overall sense of wellbeing.